If you arrive on a flight from France, Geneva’s airport is essentially a domestic destination — a series of hallways and walkways will lead you to your French baggage claim and out into the French side of the airport. If you arrive on an international flight you’ll pick up your luggage from a Swiss baggage claim. But once you’ve cleared Swiss customs, you are free to walk to the French side of the airport. (You’ll need to show your passport, though you do not need an airplane ticket). Exit the terminal from the French side of Geneva Airport and — voilà — you’ll be in France. 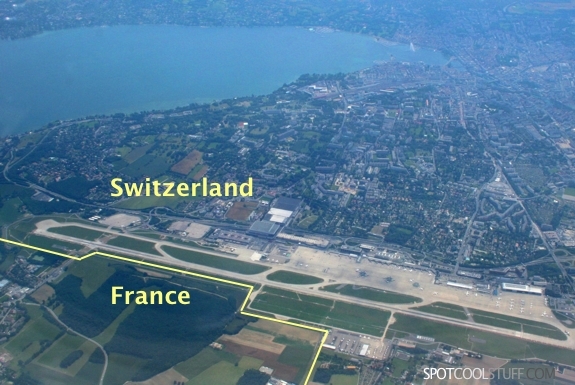 When departing on an international flight, you can enter Geneva airport from either country. Some airlines (including Alitalia, Etihad, KLM) will even let you check in your luggage on either side. But you’ll need to clear Swiss customs before you depart — unless you are flying to a destination in France. When Geneva airport was first constructed, dividing it between two countries made sense. Back then it was semi-arduous getting between France and Switzerland. Giving a choice of which country to board a flight from, or exit into, could potentially save a traveler a lot of hassle. Then, in 2008, Switzerland implemented the Schengen agreement, which removed the border controls with France and other participating countries. Since then, the quirky dual-nation status of Geneva Airport has not been much of a hassle-saver. But, for travelers, it can still potentially be a money saver. That’s because prices are cheaper in France than they are in Switzerland. If you are looking for a bite before your flight, for instance, you’ll pay less in the French side of the airport. The biggest money savings might come when renting a car at Geneva Airport. Even if you are planning a road trip entirely within Switzerland, it is cheaper renting your car from the airport’s French side. Just check that your rental agreement allows you to take your vehicle into Switzerland. (Most do.) And definitely make sure you return your car to the same side of the airport you rented it from. Otherwise your rental company will charge you an exorbitant “international transfer fee” to drive it all of 2km to the correct country. 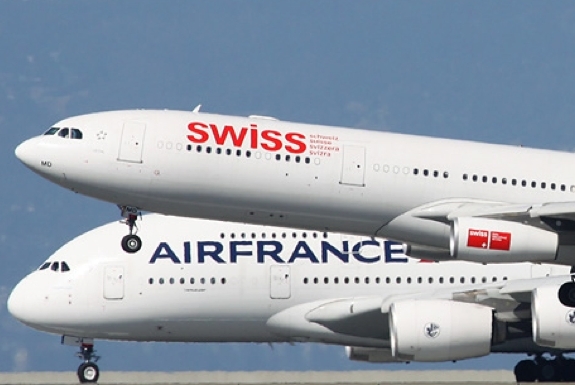 • The Basel Airport, serving Switzerland’s third largest city, is physically located entirely within France. Like the Geneva’s airport, Basel’s has two national sides. So, theoretically, you could fly from Geneva, Switzerland to Basel, Switzerland, entering and exiting both airports without setting foot in Switzerland! 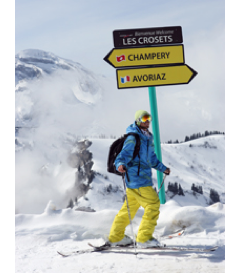 • From Avoriaz, one of the resorts in the Portes du Soleil, you can set off skiing in one direction and end up in Châtel, France. Or choose the other direction and find yourself in Champéry, Switzerland. • The Arbez Hotel, a few kilometers north of Geneva, is half in France and half in Switzerland. The border is demarcated inside the hotel. In some rooms, you might be making an international trip when you walk from your bed to your morning shower. In other rooms, you’ll literally sleep with your head in France and your feet in Switzerland. The hotel bar, however, is entirely inside France — the liquor taxes are lower.  Unless your luggage arrives before you for some reason, in which case you’ll have to go into Switzerland to get it!